With the Bulk Nutrients Referral Program, you're rewarded for simply spreading the word about us to your friends and family. But now it's much easier to refer your gym buddies, family and clients to our amazing supplements and receive store credit while you’re at it. To do so you'll need to have a Bulk Nutrients account, so if you don't already have one sign up first. Then click the "Earn Whey Cool Points" tab in the bottom left of the website. Once the Rewards Program loads, scroll to the Referrals section. To refer someone, simply copy your unique web link by pressing the copy code button, and send it their way! 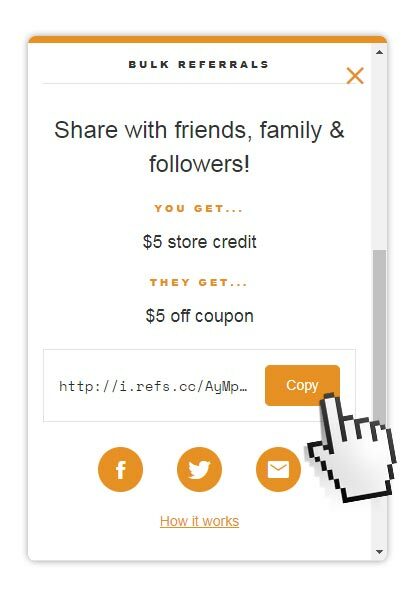 Once your friend clicks it and completes a purchase with their unique coupon code, your store credit will be automatically added. But keep an eye out as we'll be running special promotions throughout the year.